The summer just won’t quit here in Southern California, which means summery dishes even as the night comes sooner. A good Asian salad is a great weekend lunch or light weeknight dinner, and this recipe is pretty low-fat and responsible. Cut a head of cabbage into ribbons — we just got a mandolin, and that’s the perfect tool. Now make the sauce. 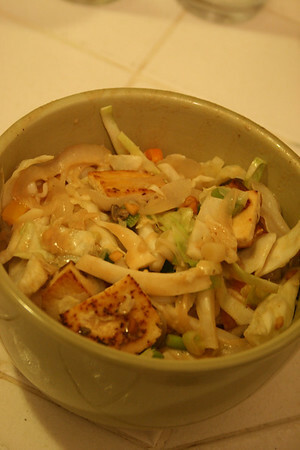 Combine rice wine vinegar, soy sauce, a bunch of peanut butter (I like chunky), garlic crushed in a press, ginger crushed in a garlic press, and a touch of toasted sesame oil to really bring out the nutty flavor. 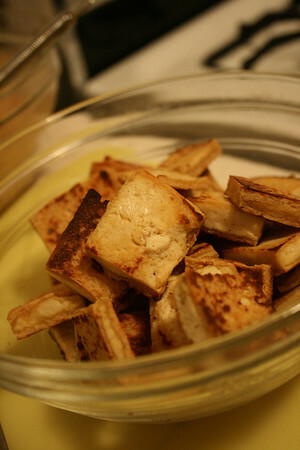 Mix together, and then thin with water until the consistency of salad dressing. 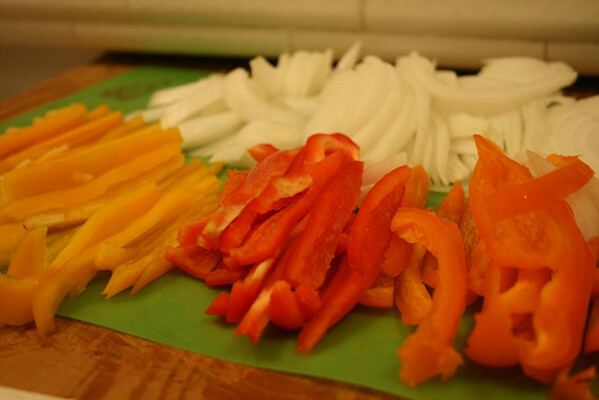 Add a little more oil and put in the peppers and onion, and stir-fry until a little soft. Crush a garlic clove over it, stir, and add the cabbage. 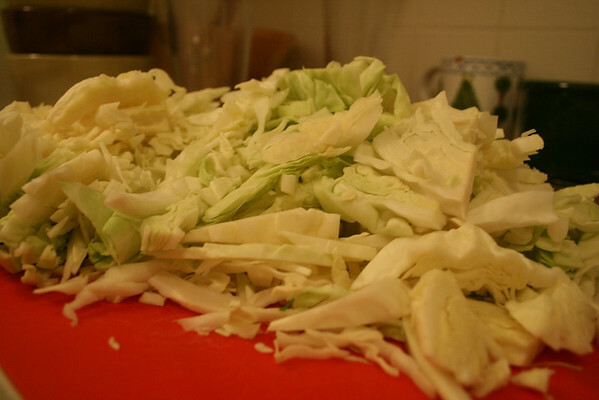 Stir until the cabbage is just a little soft, then turn off the heat and add the sauce, tossing well. Mmmm! ‘Mmmmmmm’ is right — just like you! You’re just all about the recipes this month, aren’t you? Actually, I promised that I’d have a recipe and a drink every month back at the beginning of the year, and clearly I fell behind with all the Dine to Thrive work. But, Ms. Courtmack made sure I took pics of everything, so, I’m trying to catch up with the words. Further, Auros, I promised (back in the comment-section of Wade’s New Year’s resolutions) to help him with the recipes and I don’t want to — pun intended — have to eat my words when, ‘let’s review last year’s resolutions’ time rolls around.